This is another recipe from Ann who blogs at On Sutton Place. I have shared her recipe for oatmeal cake before (and here is another great version of this cake). I like Ann’s simple homey recipes. 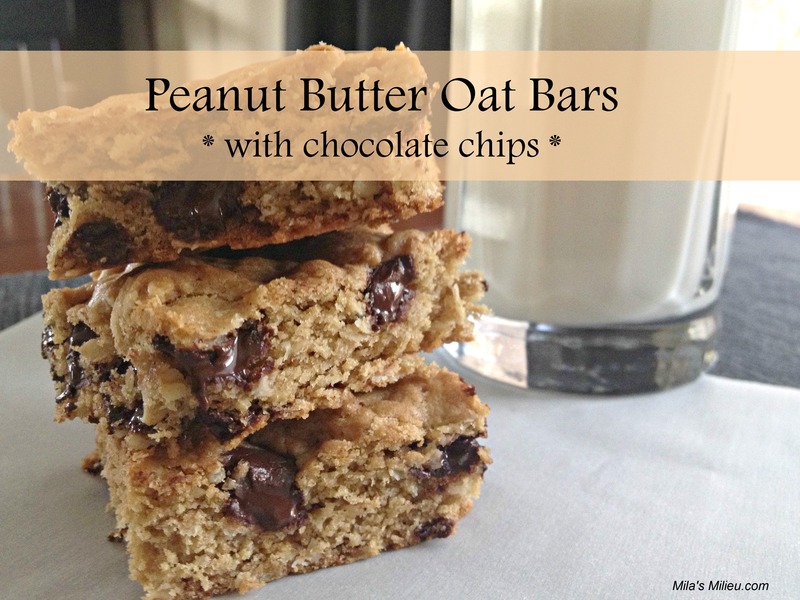 They are delicious, easy to make, and flexible. I talked before about our transition to healthier snacks and more wholesome food in general. We have been making a switch from processed food whenever possible. A couple of years ago, I started paying really close attention to labels and nutritional information and reading between the lines, really educating myself any way I could. I believe that not all of the ingredients in pre-packaged food are harmful or bad for us. But a lot of them are not good either, and I just don’t want to consume them when there is a healthier alternative. A lot of things we used to buy are sooo easy to make at home that there is absolutely no reason to buy them. Every time I rediscover certain ingredient/food that can be made from scratch without much time investment on my part, not to mention the money, I almost want to cry. 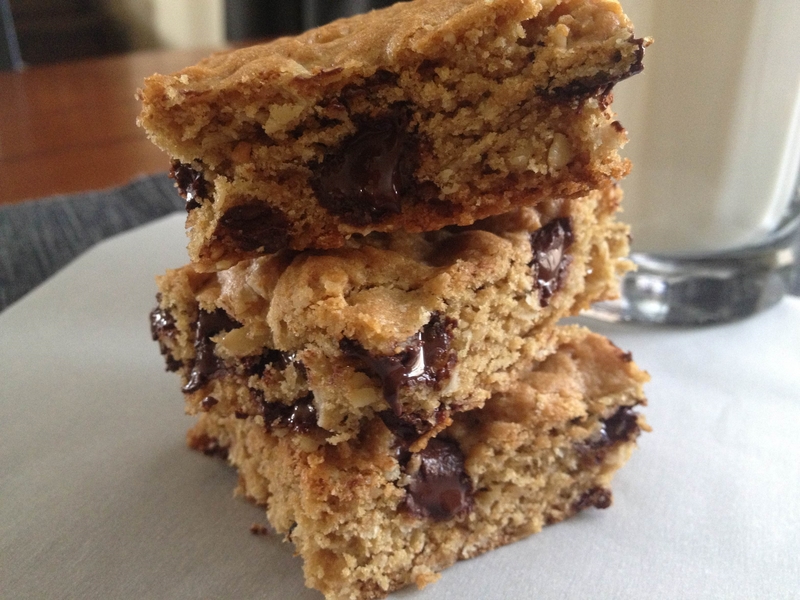 I realize that when you bake from scratch, like these peanut butter oat bars, you do have to use fat (butter or oil), and sweetener (sugar, honey, etc.). The end product, calorie wise, may not always be “diet food”. To me the important thing is that it contains all wholesome ingredients in healthy quantities and are, therefore, satisfying and energy-rich. When I have a choice, I would rather eat a small square of a home-made snack bar than a store-bought granola bar that tastes like cardboard. A great way to control calories in my home-made snacks (I don’t want a cupcake for snack, even a home-made one) is to reduce the amount of fat and sugar, sometimes by replacing them with apple sauce, other times just cutting them down. It almost always works. This is what I did with this recipe. I did add some dark chocolate chips. They begged me. But dark chocolate has numerous health benefits, so I felt no guilt at all. 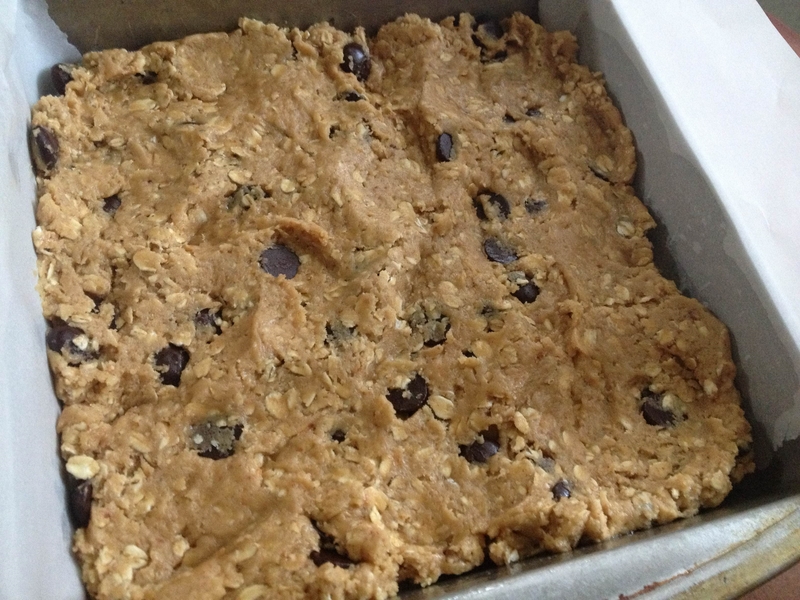 These bars come together in a flash: just mix everything thoroughly, spread in the pan and bake for around 20 minutes. 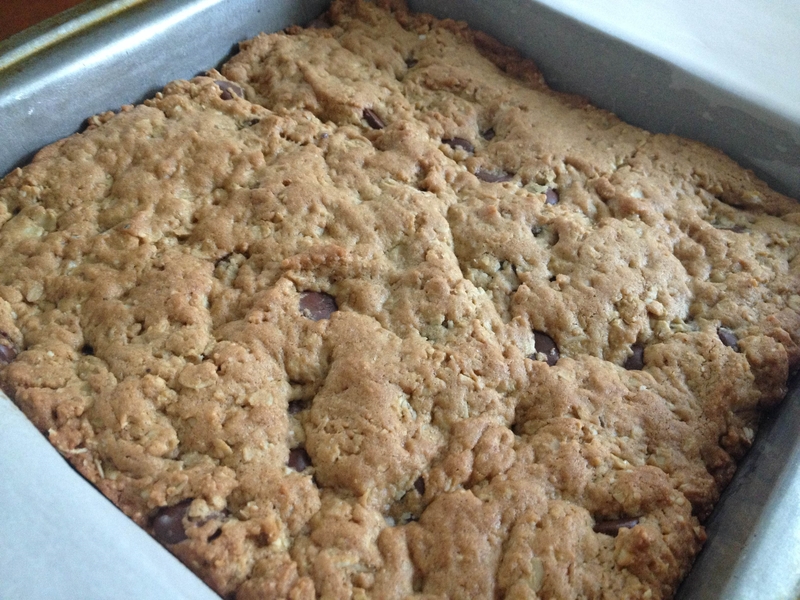 Let cool in the pan, slice into squares and enjoy. They have a dense texture, almost like a granola bar, and they are filling so one square will make you happy. I haven’t tried freezing them, but I don’t see why it couldn’t work. This would make them convenient to grab for breakfast or snack on the go. 1. Line a 8×8 pan with parchment paper or grease it very well. Preheat oven to 350 degrees. 2. Mix butter, peanut butter, sugar, eggs and vanilla thoroughly. A mixer works great here, but you can do it by hand. 3. Combine flour, oats, salt, baking soda and add to the butter mixture. Mix to incorporate, and stir in the chocolate chips. 4. Spread the dough in the form (the dough will be sticky). 5. Bake for about 20 minutes (ovens vary, start checking at 18 minutes). Once cooled down, remove from the pan and cut into squares. What are your go-to snacks that are easy and healthy? Did you find this helpful? Please share it with your friends using the buttons below! I love Ann’s recipes, too. Haven’t tried this one, but I will. I agree with you about having a small piece of something homemade, rather than a processed snack.